For every story they say there is a beginning, middle and end. For this story there is a stop in Thailand, Poland and Switzerland. During a 3 week circumnavigation around the globe, Scott Rogers and myself spent about a weeks time in each country playing with gravity and doing a little “work” along the way. It was a trip of many firsts for me where I experienced my first (B)uilding B.A.S.E. 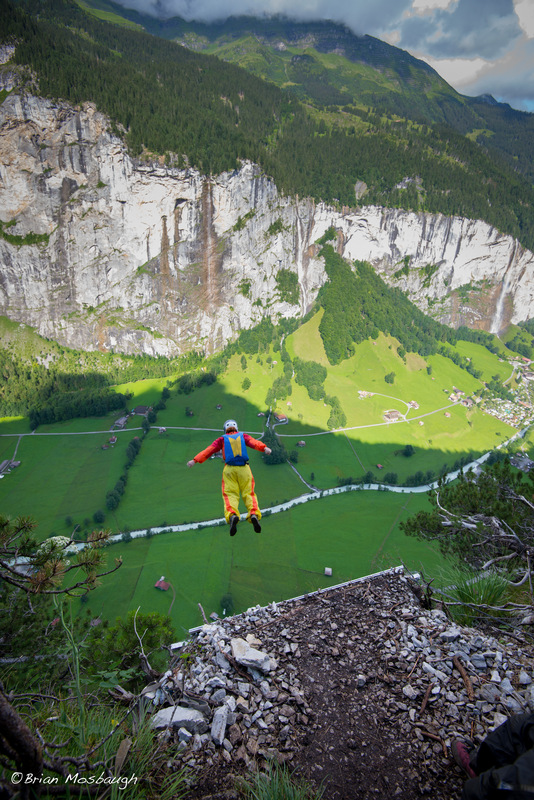 jump, rigged a new world record urban highline 600′ above Bangkok’s busy city life, committed to my first terminal tracking BASE jumps in Lauterbrunnen, Switzerland, and saw so much more along the way. I attempted to capture some moments on the blazing trail and here are a few glimpses of the beauty and diversity of the sights, sounds and people we got to play and smile with. I hope you enjoy! First stop on the world adventure travel tour is Bangkok, Thailand. Scott Rogers, Andy Lewis and I got busy right off the airplane rigging a 560 foot long highline 600 feet above the urban sprawl of the hot humid city environment. This was all part of a deodorant commercial in collaboration with Gibbon Slacklines. Thanks Jan Kaeding for the amazing invite and excellent memories. The new world record length urban highline has finally been rigged after waiting on the vectran to pass through customs. 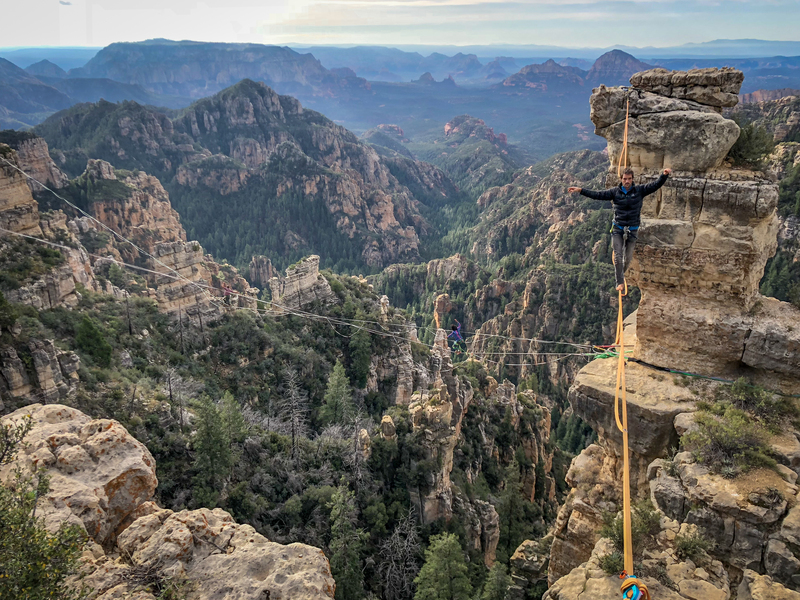 It weighs in at 170 meters long (557′) and 160 meters high (524′)… Andy made his first attempts on the line in the middle of the night at 3:00 AM. He was able to walk the last 30′ or so successfully but we’re waiting on daylight to really get the rig dialed in… One of the most impressive lines I’ve seen to date! So much thanks goes out to everyone who has been a part of this effort and project that is finally just starting: Paul Amornwet of tab Agency, Jan Karl Alexander Kaeding of Gibbon Slacklines, Balance Community: Slackline Outfitters, Scott Rogers for all the rigging assistance and as well a big shout out to our support team of Thai climbers that have been such a big help! 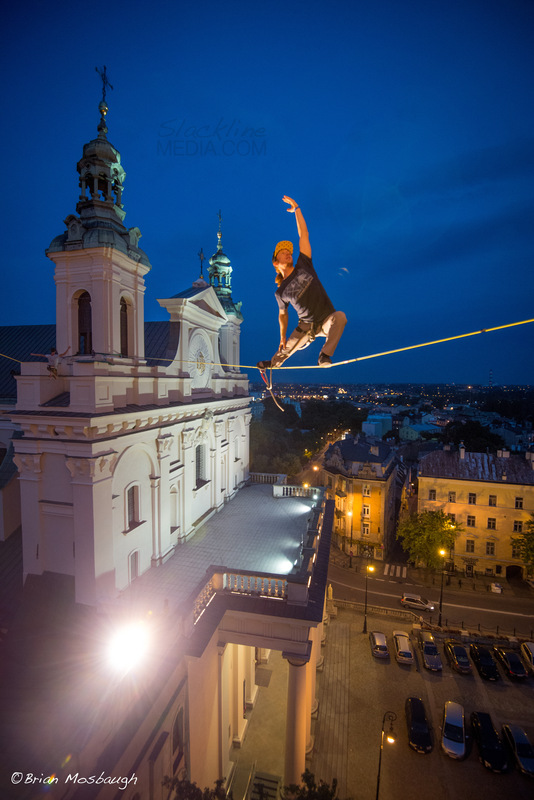 Slackliners from around the world have been gathering in the quaint historical town of Lublin, Poland, for the past six years rigging dozens of highlines in this amazing urban setting. 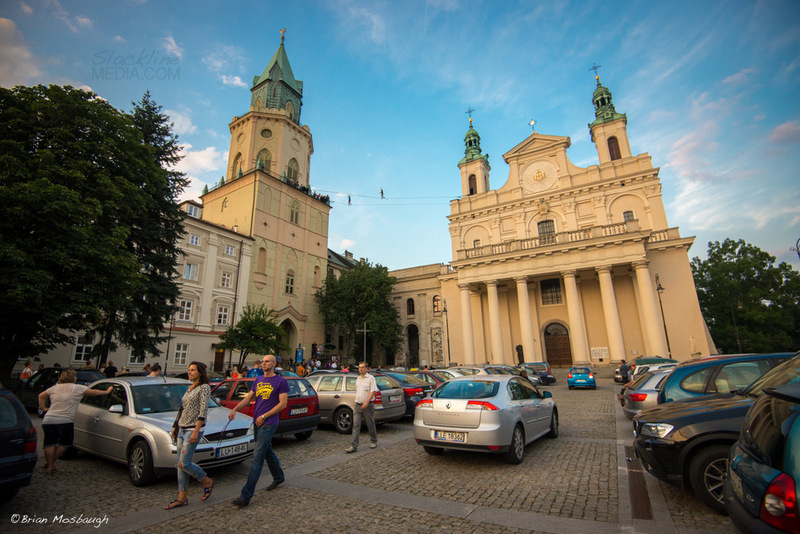 Thanks to the efforts of Jan Galek, Faith Dickey, Jordan Tybon, Wojtek Kozakiewicz and so many more, this gathering continues to grow in attendees as the slack scene becomes globally widespread and more individuals discover the benefits of being better balanced people. 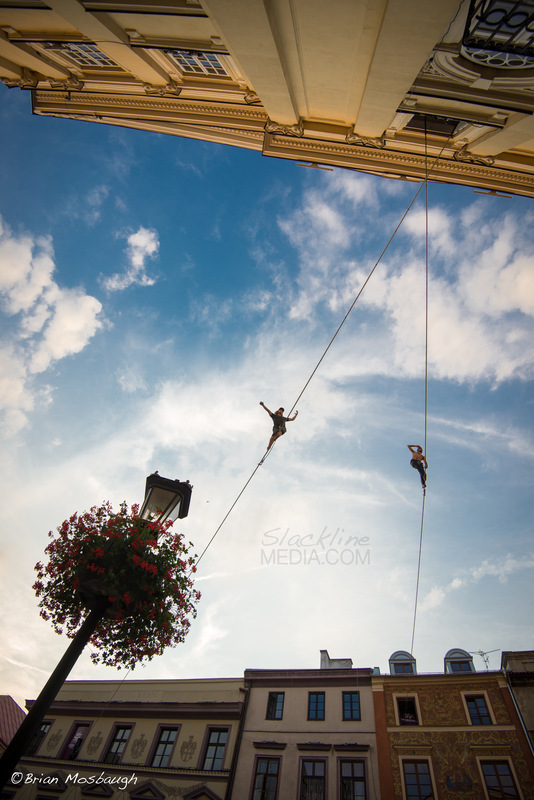 This celebration takes place alongside a massive gathering of Carnival arts comprised of mimes, aerial silk performers, contortionists and other acrobats. 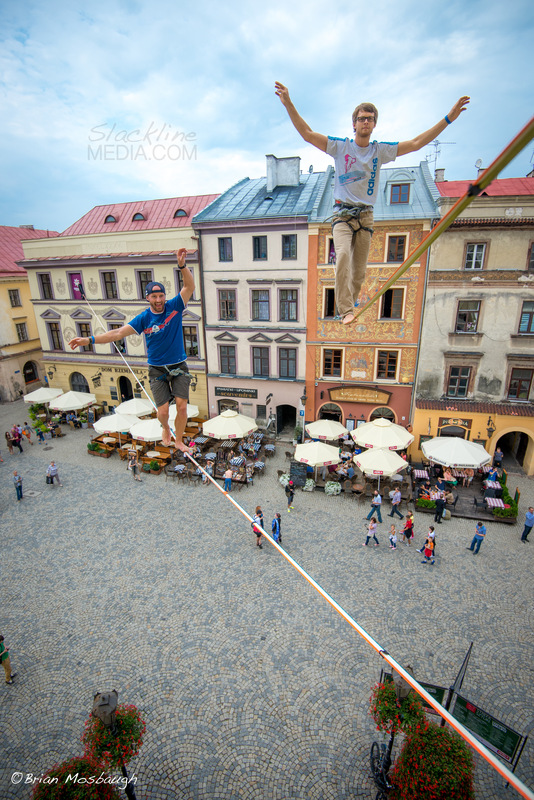 The vibe is so much different than Bangkok and it was an incredible experience to see so many familiar old and new faces in the community of modern slacklining. Officially the Europeans have been pushing the sport in a huge way with monumental advances in the lengths of highlines walked and exploring new environments to establish lines in space. Without a doubt, the two church highlines were my favorite to walk at this gathering. If I could share one bit of advice concerning this event it would be to attend every year if you have the chance! 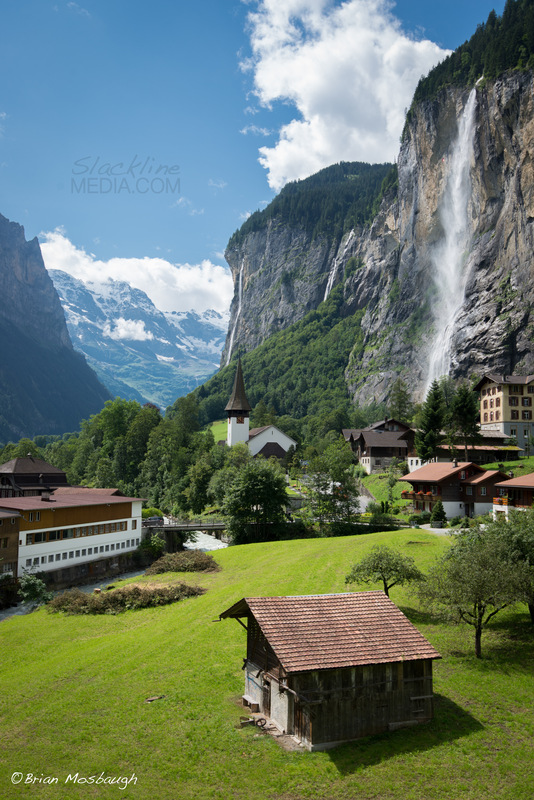 Welcome to the world of 2,000 foot tall limestone cliffs amidst the most beautiful alpine mountain environment you’ve ever imagined. With gondola services that take you to the top of either side of the valley with countless world-class BASE exits. 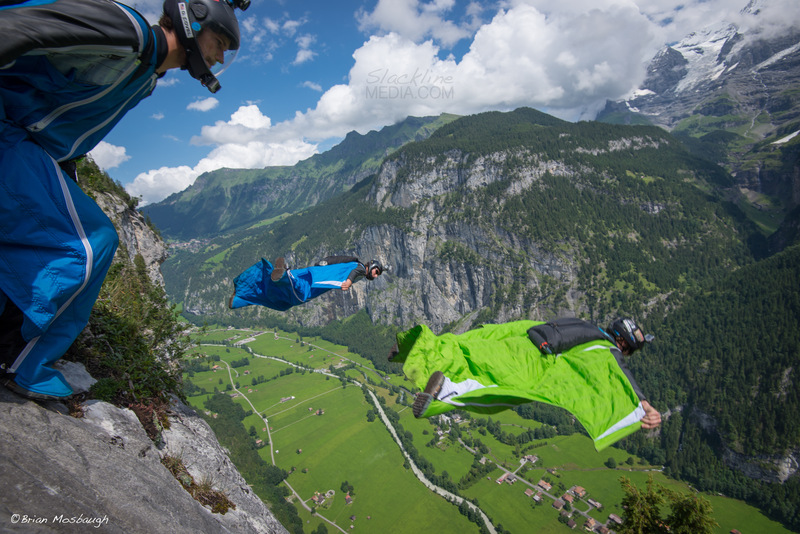 This magical place is either a Disneyland paradise for talented wingsuit pilots and trackers to test their skills or The Valley of Death if you make any mistake. Taking anywhere between 8-15 second free fall delays, before pitching your pilot chute and being under an inflated canopy, you can leap from these great heights and fly like superman. After landing in a soft grassy field you’re only a 15 minute walk to the nearest local pub and cuisine. 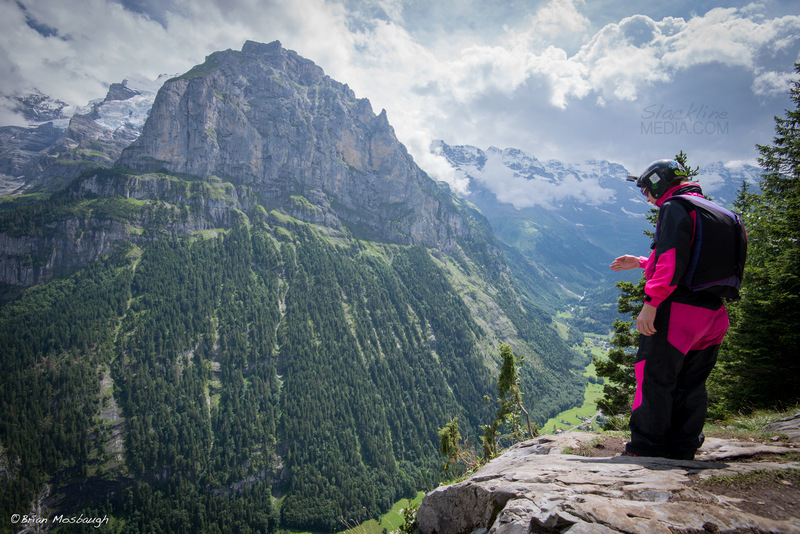 For those more adventurous types, a couple gondola rides plus a 3 hour hike in the mountains can get you to the top of the infamous North Face Eiger Wall. This place absolutely blew my mind in terms of how outrageously scenic it was and the gravity of having to perform every jump with flawless execution. 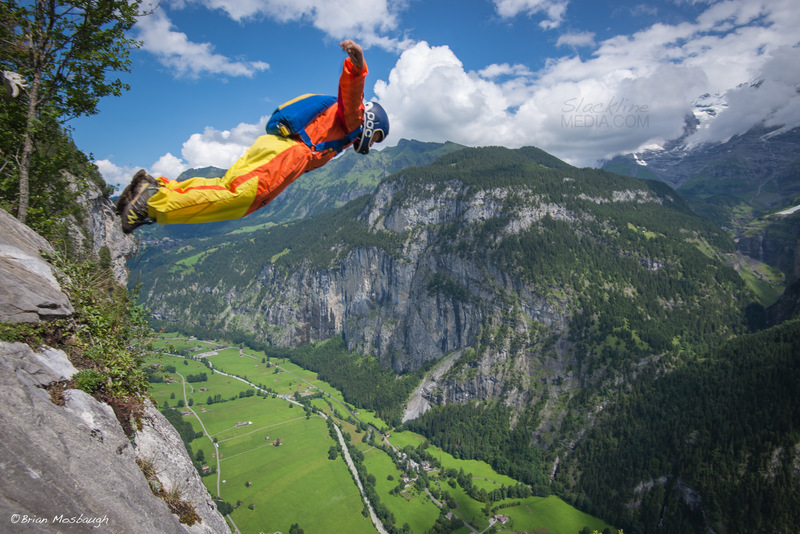 It seemed everyday someone was having a cliff strike, landing in the tall trees or worse, which added to the commitment level of every action I took. I’ve made it a goal to spend time in this magical place every year, as long as I’m current in my flying skills. Thanks so much to Andy Lewis, Scott Rogers and Jimmy Peterson for being there on my first long free fall delays, you brothers will always be near and dear to my heart!